I don’t know if I have had more bad experiences with batteries than the average motorcyclist encounters, but I know I’ve had enough to feel like I could tell an average motorcyclist more about how a battery works than they care to even find out. The battery on my NT650 gave out one morning not too long ago, just before heading out to work. Normally, when that happens (as it has before), I just bump-start the motorcycle and ride out anyway. But this was with the battery that came with the bike when I bought it, so I didn’t really know much about the battery or its history at the time, let alone what brand it was. So I just parked the bike, and drove to work. While away, I left the battery to charge with my trickle charger. Invest in a quality trickle charger. They help keep your battery healthy, prolonging its life. After I came home from work, the trickle charger indicated a healthy charge, which I confirmed with my multimeter. Leaving the multimeter on the terminals, I turned on the bike, then fired it up. The multimeter indicated normal voltage readings for the battery in each of the cycle, so perhaps there was an issue with my NT650’s charging system not properly charging the battery on its own. I turned the throttle for the revs to climb past 3000rpm, which is where the engine needs to be spinning at to start charging the battery. My multimeter showed the battery was being properly charged. The last thing I did was pull the battery out of the battery tray, and have a look at who manufactured it. Once I saw the brand, it was all I needed to see. I ordered a new battery the next day. I have had excellent experience with a Yuasa battery or a Yuasa-made battery. 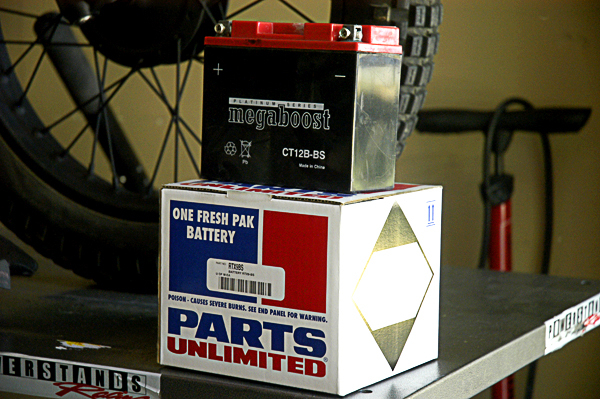 Tip: Beware of motorcycle batteries – or any batteries for that matter – that come with a lifetime warranty. I know it sounds like such a great deal to have a guarantee for life, but not when you soon find yourself having to cash in on the warranty more frequently than you probably ought to be. Stick with the proven makes of batteries, those that don’t offer fantastically long warranties because you can be assured that the battery has been made to last. 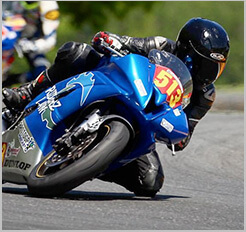 And since we’re on the subject of battery tips, a trickle charger is a must-have for any motorcyclist, especially those living in parts of the country or the world where year-round riding isn’t available. 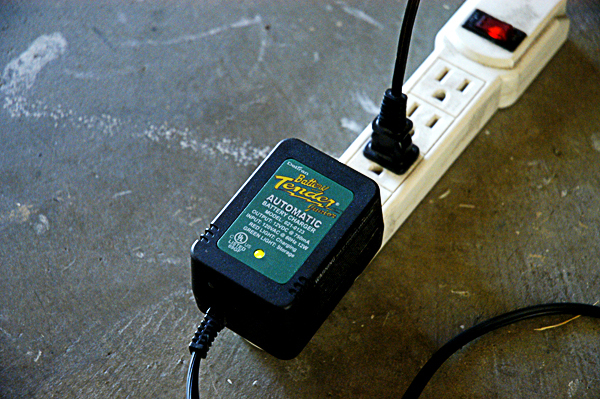 A trickle-charger will help prolong your battery’s life, even when your bike sits more than you get to ride it. Batteries are ALWAYS in a state of discharge; it’s the trickle charger’s job to keep the battery healthy during the times when your bike’s not charging it, i.e. when you’re not riding. And while you’re at the store picking up your trickle charger, grab yourself a multimeter. 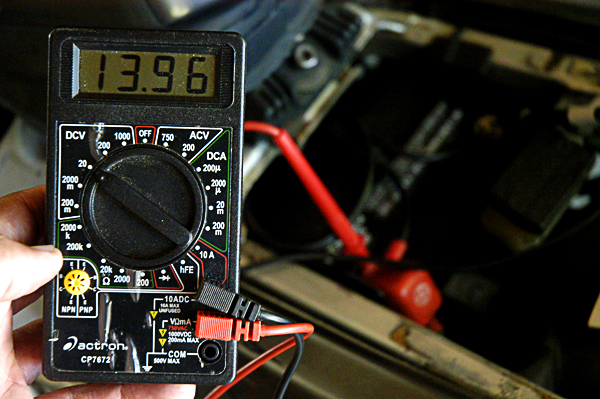 Multimeters are a great way to monitor your battery’s health, as well as troubleshoot any problems you might be having. A multimeter is the only way you can tell how healthy (or unhealthy) your battery is at any given time, whether in use or not in use, and also allows you to find out whether you’re having a problem with the battery, or something else in your charging system. A battery at rest, on the trickle charger; looks mighty healthy to me! 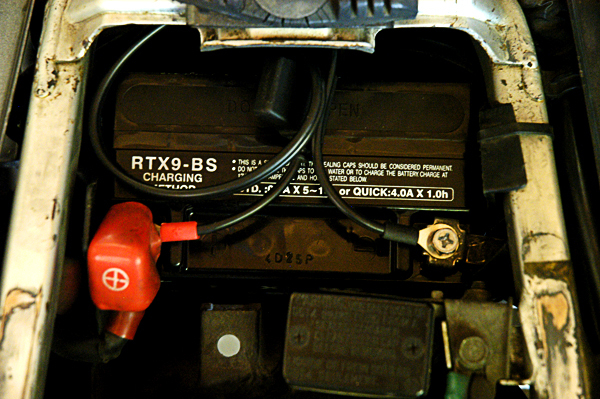 If everything else in your motorcycle is in good, working condition, your battery typically does not need frequent attention. However, given how crucial it is in getting your bike running (unless you’re fine bump-starting your bike every time you ride), a trickle charger and a multimeter are a pair of investments that will pay for themselves in time. Make sure your garage is not without either of these.